Basement leaking is a problem that millions of people face. While most homes are designed with waterproofing in mind, sometimes the measures taken at the time of construction don't last for the lifespan of the home. There are plenty of factors that can contribute to a breach in your home's moisture barrier including heavy rain or other precipitation, acidic soil, or the introduction of solvents into the soil - both of which can eat away at your basements layer of sealant. Basement leaking means a lot more than just wet floors, unfortunately. The humid environment means that your home becomes more susceptible to harmful growths, and the moisture can extensively damage just about every component of your home. The damage caused by water from basement leaking is cumulative, too, which means that it causes damage more and more quickly the longer that you leave it untreated. If you're experiencing moisture, dampness, leaks, drizzles or pools of water in your basement, it's definitely time to get it fixed. Getting your basement fixed probably isn't as big of an endeavor as you imagine, while repairing extensive water damage can be incredibly time consuming and expensive. The signs of water damage are various and plenty. Often, by the time you've seen the symptoms of water damage repairing your home is already an expensive endeavor. When water leaks into your basement, it increases the humidity of the air by evaporating. That increased humidity dampens and moistens the construction materials of your house which weakens them considerably over time. It's not uncommon to see your linoleum floor tiles buckling, your paint peeling, drywall crumbling and breaking, joists and other structural supports drooping or rotting, and ceiling tiles discoloring and falling away. That's not all, either. In addition to being bad for your home structurally, the presence of moisture and water in your home is terrible for your health. Moisture aids the growth of mold, mildew and fungus, all of which increase the rate at which your home deteriorates and drastically effects the quality of air in your home. These growths can cause coughs and sneezing fits, upper respiratory infections, and aggravate existing conditions like allergies and asthma. The damage that water can cause to your home is extensive and difficult to repair, so if you're experiencing basement leaking it's imperative that you get it fixed as soon as possible. Give us a call to learn more about how to solve this problem today! Every basement is made to be waterproof, so leaks and drips inside your basement are often the sign of a worn out moisture barrier. The water in the soil around your home is constantly exerting pressure on your basement walls. The more water that is in the soil, the more pressure is exerted. If your basement has been subjected to plenty of pressure over a long period of time, its sealant may crack or break allowing water into your home – and the result is your basement leaking. Dense tree or bush coverage in your yard may contribute to your leaky basement, too. With dense coverage less sun is able to shine on your yard, which means less evaporation occurs. Your soil staying waterlogged means increased pressure on your basement walls, which could damage your waterproofing over time. 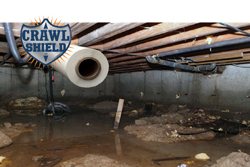 Regardless of what's causing your basement to leak, we're confident that we can fix the problem. Remember, fixing your leaky basement now is a far better option than repairing water damage later.